When developing new friction calls, our number one goal is to build calls that continue to raise the bar in sound quality and realism! For years now, our "Cherry Classic Crystal" has been the go to call of thousands of great turkey hunters across the nation. 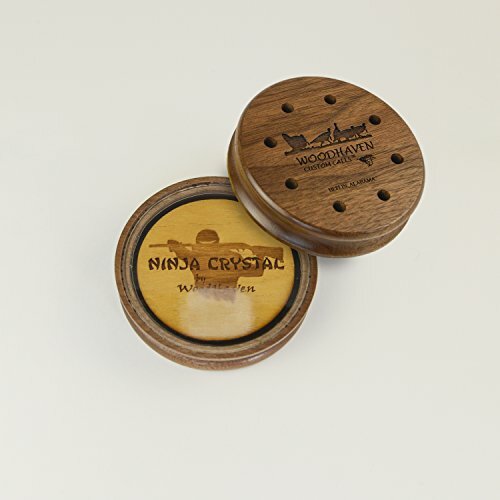 At WoodHaven, we are proud to announce an additional crystal call into our lineup of friction pot calls called the "Ninja Crystal". The "Ninja Crystal" is built into a Walnut pot with a Yellowheart soundboard which offers a very true to life turkey sound. This call comes with two hand-matched strikers, one being our new Yellowheart/Walnut "Ninja Stick" and the other being Hickory that that will offer each hunter the ability to sound like two different hens. The "Ninja Crystal" produces great two-tone yelps as well as great cutts, cackles, and purrs. This call affords you the ability to call both loud and soft. The all new "Ninja Crystal" is a killer call that is soon to be a favorite among turkey hunters nationwide!